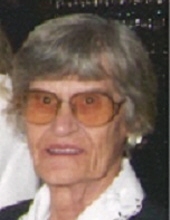 Leona M Johnson, 89 of Kansas City Kansas passed away April 5, 2019. Leona was born to Earl A. Williams and Madge Chrisman April 29, 1929 in Kansas City Missouri. She grew up in the east bottoms graduating from Manual High School in 1946. She married Albert Ulysses Johnson, November 1947. They survived but lost everything in the flood of 1951. They bought their home in Rosedale, KS and Leona resided there for the past 67 years until her passing. Albert and Leona raised 4 children, 7 grandchildren, and was blessed with 17 great grandchildren and 9 great-great grandchildren. Leona retired from KCK Public Schools, and she will be remembered for her countless talents including, Sewing, knitting, crocheting, macramé, painting, woodworking, ceramics, furniture upholstery, refinishing antique furniture, fishing and reading. Leona loved family get togethers and will be fondly remembered for her countless hand made cakes for birthdays for family and friends. Leona always said,"if you could read, you could do anything you put your mind to". Leona was preceded in death by her loving husband Albert, a daughter and granddaughter. To send flowers or a remembrance gift to the family of Leona May Johnson, please visit our Tribute Store. "Email Address" would like to share the life celebration of Leona May Johnson. Click on the "link" to go to share a favorite memory or leave a condolence message for the family.